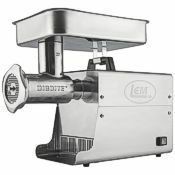 You likely already know the benefits that owning a meat grinder can bring to the food you process and cook. Fresh ground food tastes so much better, and it’s better for you. 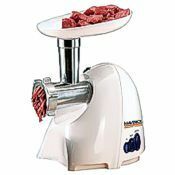 Meat grinders provide increased safety, better flavor, and improved texture to your meat. At Pleasant Hill Grain, we carry top-of-the line, high quality grinders that work great and are built to last. Several factors are involved in choosing the grinder that’s perfect for you. Because we really know the products we offer, we can help you make a buying decision you’ll be happy with for years. Below we’ve outlined some of the best meat grinders on the market from Maverick, LEM, and Pro-Cut. 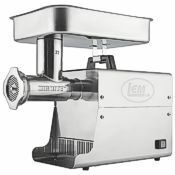 Depending on your needs, we also carry other meat grinders and meat processors that all live up to our quality standards. If you have any questions about meat grinders, give us a call and talk to our friendly, experienced customer service staff! For an economical option that still provides impressive speed and power, we recommend the Maverick MM-5501 Grinder. This model uses a 575 watt motor to grind over 23 pounds of meat in only 10 minutes! It has a sleek, attractive design and runs quieter than many grinders. 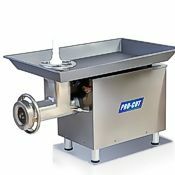 Whether you’re looking to grind cheese, vegetables, nuts, or all types of meat, this machine can do the job. 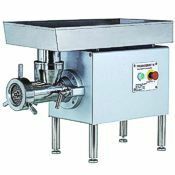 With its 100% duty cycle, it can be operated continuously (even hours on end) and your purchase includes three grinding plates, a stomper, and sausage stuffer tuber and spacer. All parts are BPA-free. While this machine is a compact tabletop grinder, it really packs a punch and gets the job done. 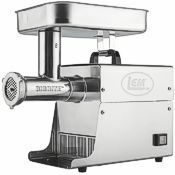 The LEM 780 Big Bite #12 meat grinder has exclusive features and quality stainless steel construction that mean you get more grinder for your money—and your investment will last for many years of trouble-free meat processing. This machine features all steel gears and roller, not sleeve, bearings and a built-in circuit breaker protects the motor from overload damage. 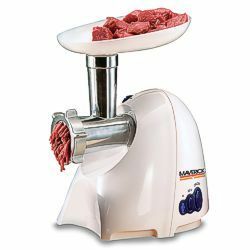 It’s a great choice for frequent grinding and averages 10 pounds of meat per minute. 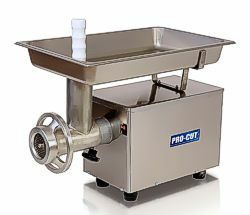 The “Big Bite” name refers to this meat grinder’s special auger design that lets it grab meat chunks from the feed throat more aggressively than other grinders, so you don’t waste time and energy on extra stomping. 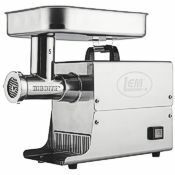 The LEM 780 grinder offers smooth operation from the start until all your meat is ground. It also comes with a two year warranty. The LEM models are very popular with our hunting customers. 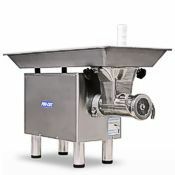 Popular among small commercial shops and avid hunters, the Pro-Cut KG-12-FS meat grinder offers commercial meat grinder construction and performance with a very affordable price tag—placing it at the top of our brand comparison list. If you’re looking to grind a large amount of meat this hunting season, this grinder will serve you well. With its high torque 3/4 horsepower motor and #12 grinding head, the KG-12-FS will grind 7.3 lb./minute on the first grind (3/8" plate) and 4 lb./minute on the second grind (1/8" plate). It has a 100% duty cycle for nonstop grinding. 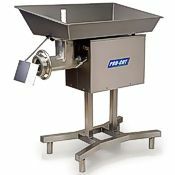 The extra large, heavy-gauge feed tray measures 2.5" x 13" x 21", providing outstanding stability that’s superior to the thin trays on many grinders. This model is also UL and NSF certified. Pro-Cut grinders are exceptionally well-engineered and built tough enough to tackle commercial-duty grinding all day long. Pleasant Hill Grain is among the largest stocking distributors of Pro-Cut equipment in the U.S. 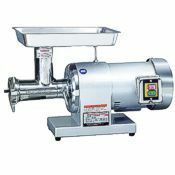 If you’re looking for a meat grinder that can manage an even higher volume, consider the Pro-Cut KG-22-W meat grinder. With its strong high-torque motor rated at a full one horsepower and a big #22 grinding head, the KG-22-W will grind 29 lb./minute on the first grind (3/8" plate) and 14 lb./minute on the second grind (1/8" plate). 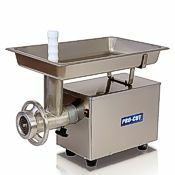 Its extra large, heavy-gauge feed tray measures 3" x 15" x 28", so you can really load up a lot of meat—which is good, because this grinder goes through it fast! 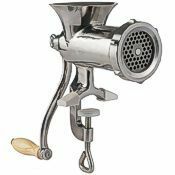 With any meat grinder, meat should first be chilled almost to freezing, and kept cold right up to the moment of grinding. This keeps the fat (both external and within meat cells) very stiff, so everything shears cleanly. Warm meat smears, pulls and tears, creating high drag that overloads a grinder’s motor and causes plugging and premature wear. Warm meat also grinds mushy. Grinding your meat very close to 32°F produces superior texture and easy, efficient grinding. Chill your meat sufficiently, then remove from the cooler just the amount that you’re ready to grind immediately. Another key meat grinding tip: Always use a sharp knife and plate, and be sure they fit each other properly. The cutting edges of a new plate/knife set will be very sharp, and they’ll also be in the same perfectly flat plane. As the knife and plate are used together, they’ll wear in a pattern that's no longer perfectly flat. They’ll work that way for long time if they're kept together as a set, but if a used knife (even one that’s still sharp) is combined with a new, perfectly flat plate, there will be some narrow gaps between the cutting edges of the knife and the edges of the plate's holes. The effect of this mismatch is same as if the edges were worn out and dull. Imagine trying to cut paper with a scissors that has some gaps between its blades—it works the same way with a meat grinder. For this reason, we recommend using a separate knife for each plate and carefully keeping that pair of blade and plate together. Even mismatches that you can scarcely see will have a big effect on performance and output. Plates are reversible; one side should be used exclusively with one new knife, then when the plate is reversed, the knife should be taken out of service and replaced with a new one for the fresh side of the plate. The sharp corner of a hard tool like a screwdriver can be used to make scratch-marks across the old side of the plate, so you can easily tell the sides apart in the future. 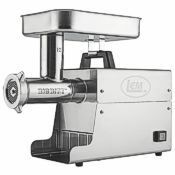 Pleasant Hill Grain provides a superior online shopping experience for home and kitchen products, including our selection of high quality meat grinders from Maverick, LEM, Pro-Cut, Waring, Thunderbird, and Weston. We know and use our products, and offer only machines that offer strong performance, great features, and long-life durability. We offer free shipping on all electric meat grinders, and provide phone support from our friendly, experienced customer service staff. We’ve been selling and supporting quality grinders for many years, and we would appreciate your business! Have questions? Please call us at the number below—we’d love to help you select a meat grinder that’s perfect for your needs! Size measured width x depth x height, in inches. Grinding rate is measured in pounds per minute. 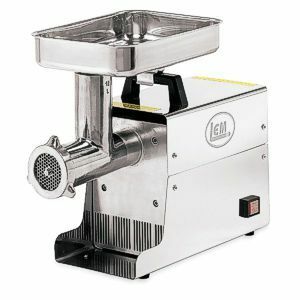 You can see all of our consumer meat grinders here (link opens in new window).